NEAR THE CROSSROADS OF NORTHERN FL. Easy access from IH 10 and IH 75, minutes from downtown Lake City both old and new. Many restaurants and great shopping. Easy drive to Suwannee River with plenty to see and do. This park has wonderful amenities and friendly staff. We enjoyed the clubhouse to shoot pool and pitching horseshoes under the trees. They have monthly events and crafts for kids, a lending DVD and book library to encourage the family atmosphere. We stayed a month and enjoyed the camaraderie of the seasonal campers. Location is very convenient to the route 10 corridor, which makes it a bit noisy from trucks. Having said that, we would stay here again when in South Georgia or North Florida. This was a great park to stay at overnight. Easy on and off the Interstate. We would stay here again. My only suggestion would be for them to pave the roads. The roads were a bit dusty. Right off I-10 and just a few miles East of I-75. Easy in and out. But a bit out of town so not close to restaurants etc. Gravel with concrete patio and picnic table. Nice and Level and plenty deep, my only complaint is they are a fairly narrow. My hooks ups were very close to neighbors patio. Excellent Wifi. There are Access point everywhere in the park, so there is a good signal at all sites, and speed was impressive for an RV park (19 down/2.5 up). Nice park like feeling with just enough trees and Spanish moss to keep it from feeling like a field or parking lot, there are a couple of ponds and a nice pavilion. All sites are pull through. Staff was friendly. My Tmobile router had a poor signal but I didn't mess with setting up the external antenna since wifi was so good (6 down/1 up) ATT was great(40 down/13 up) . $36 with Good Sam Discount seemed reasonable. This is a wonderful park, it has a lot of room to walk your dog which was a big appeal for me. The grounds are well kept. The restrooms are in the clubhouse and they were very clean and the staff was very nice. The laundry has all new machines and it was immaculate. Since my husband and I are in our 70's we don't look for water parks and superfluous stuff; I want trees and grass and places to walk and ease of parking our rig. This is an easy off and on I-10. We will definitely stay here again. I agree with the other reviews about the great, clean facilities and the friendly, helpful management. The pull through sites for overnighters are small, so that was the reason for 4 star instead of 5 star. I'm writing this so that others reading reviews will know that the park is maintaining high standards and is one of the cleanest. Road noise happens in lots of parks. Prefer it to train crossings! The campground was a hit with all of our club members including those with class A, class B, class C, fifth wheels and travel trailers. Showers were spacious and both showers and bathrooms are very clean. WiFi and cable TV was good and the air conditioned clubhouse easily accommodated 44 people with plenty of room for the potluck dishes, card games and some folks enjoyed watching the Olympics on the LARGE flat screen TV. The management is friendly and even prepared the clubhouse for our needs! The staff was very helpful and very accommodating. While we didn't use the laundry facility, the 4 washers and 4 dryers looked well maintained. There are 67 RV sites with concrete patios; most sites are pull through, some are under the trees and others are out in the open. Some sites can be a little tight depending on your rig size and number of slides but the management had taken that into account when making the site assignments and there were no issues. There is no pool and the roads are mostly gravel, but both the pool and blacktop is scheduled to be completed in the near future. Our club will definitely be returning to the campground in 2017! Had no issue with I-10 traffic noise even though we were the closest to the freeway. Clean place, friendly folks and a couple of little alligators in the ponds. I'd stay here again, no problem. Severe storms when we got there so had to trump around in wet grass, but oh well. Stayed over night. Staff was friendly and helpful. Park was nice, but sites were a little to close together for my taste. Good WIFI and Cable TV coverage. Sites were fairly level and interior roads were gravel and in fair shape. The site I had was very near I10, but road noise was not a problem. Clean and close to I-10 for us. Nice staff, clean restrooms and well kept park. I would stay here again. This is a very nice campground. Concrete pads, full hookups, pull thru sites, and immaculate bathroom facilities. Nice community lounge room with pool table and big screen available. All the conveniences you could ask for except no pool. Detractor is the road noise from nearby I-10 but if your ok with that this is a great place to visit. We will be returning when we are in the area. I called and on the same day checked in, I arrive later than I expected and there was a packet in Plain-view at the office that helped me go exactly to my site. Hook ups are very easy at sites ,as someone noted before, sites were designed before slide outs were common. With that said I had a pull through site and very easy to get in and out of. I only needed an overnight stay so I didn't check out any of the facilities. 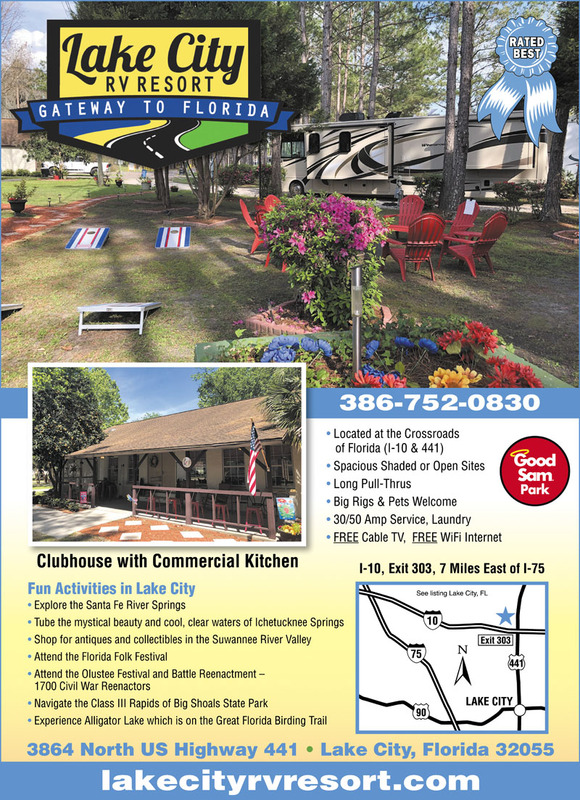 This campground resort is under new ownership and management. We stayed here a couple of years ago under the old owners. We couldn't believe the changes this year in both the facility, and the attitude of the management and ownership. The owner has spent a lot of money upgrading the facility and it's infrastructure. Showers and bathrooms are very clean and showers are plenty large. the WiFi is also greatly improved with more improvements to come in the form of repeaters or boosters. The clubhouse is completely refurbished with a new coat of paint, a new, LARGE flat screen TV and a very nice new Brunswick pool table. The management is friendly, helpful, and accommodating. The laundry has all new equipment including 4 washers and 4 dryers. The building is air conditioned. There are 67 RV sites with concrete patios; and most are pull through. Some are under the trees, and some are out in the open. The only minor problem results from the fact that the park was designed and built before the advent of slide outs. As a result, sites can be a little tight. That having been said, I will again reiterate that the management is accommodating as traffic may allow. While here we have seen 45 foot motorhomes and large fifth wheels come and go. The roads are mostly gravel, but blacktop is on the list, There is no pool, but it is also reported to be on the list. The new cable TV system is now up and running with 48 channels, and a good variety of stations. We are happy to see these improvements and look forward to returning next year. This is the most beautiful park in Lake City! I can't say enough about how nice this place is with a new owner and management team! They have renovated the clubroom and kitchen with all new furniture, flat wide screen T.V. and a pool table, this is the best I've seen hands down! They also have spotless indoor restrooms with large showers, a brand new laundry room with new equipment that are open 24 hours and it looks like more improvements are coming all the time. I absolutely love sitting on the rustic front porch in the rocking chairs to take in nature with my morning coffee. They have lots of shaded spaces and the large trees are beautiful right now with fall colors you don't get to see anywhere else in Florida. Easy access and long pull through sites right off I-10. We love it here! 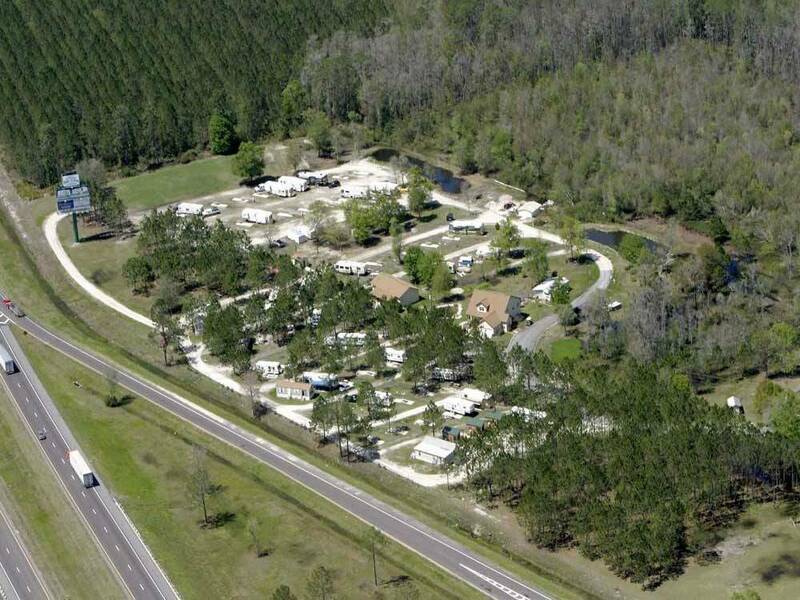 Great little RV park. What bring it down in the ratings is the ROAD noise. It sits next to a freeway ramp and you can hear the 18 wheelers all night. Great for over nighters.